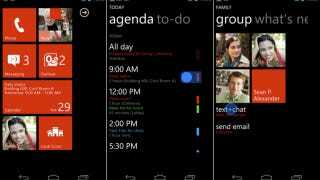 Now that we've gotten a look at Windows Phone 8, The Verge has gotten ahold of a reported HTC roadmap that's giving some clues as to the specs and timing of the debut of Microsoft's next-gen operating system. On the lower-end is the "Rio," not to be confused with the animated movie about a macaw in Brazil. Slated to drop in October (the most solid timeframe we've heard yet), it's got a 4-inch WVGA display, 5-megapixel lens with 720p motion capture, 14.4Mbps HSPA, 512MB capacity, and a Qualcomm MSM8227 chip. Next up is the Accord, no relation to the reliable Honda sedan, also due in October. This one is bigger, faster, and more powerful with a nice 4.3-inch Super LCD 2 screen, 8-megapixels on the camera, 1080p video capture, and 42Mbps HSPA+. It's also a gig of RAM and a speedier dual-core processor. The third member of HTC's 2012 Windows Phone party is the Zenith, in no way affiliated with the TV brand, expected sometime in the fourth quarter. This guy is the best-looking and biggest one of the bunch, with a 4.7-inch Super LCD 2 display, 8-megapixel sensor with 720p, and 42Mbps. It's the mightiest of these gadgets, powered by a quad-core Qualcomm Snapdragon chip.